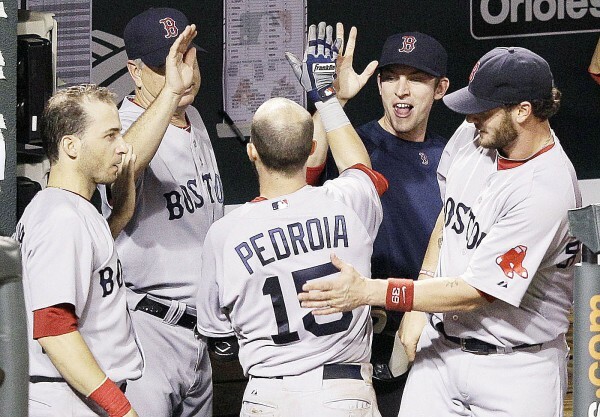 Boston Red Sox teammates congratulate Dustin Pedroia in the dugout after he hit a solo home run in the fifth inning of Wednesday night's game in Baltimore against the Orioles. Baltimore scored twice in the bottom of the ninth to earn a 4-3 victory. BALTIMORE — The Boston Red Sox completed their September collapse in horrific and historic fashion, falling out of the playoff chase by allowing two ninth-inning runs in a 4-3 loss to the Baltimore Orioles on Wednesday night. The Orioles won the game in the ninth against Boston closer Jonathan Papelbon (4-1), who struck out the first two batters before giving up a double to Chris Davis. Nolan Reimold followed with a double to score pinch-runner Kyle Hudson, and Robert Andino completed the comeback with a single to left that Carl Crawford couldn’t glove. Pitching on three days’ rest, Jon Lester limited the last-place Orioles to two runs and four hits over six gritty innings. But it wasn’t enough to prevent the Red Sox from absorbing one final blow. In the seventh, Boston’s David Ortiz was thrown out trying to stretch a single, and with two outs rookie catcher Ryan Lavanway bounced into a fielder’s choice. Lavanway, who homered twice in an 8-7 win Tuesday, went 0 for 5 and stranded nine runners. The Red Sox went up 1-0 in the third when Mike Aviles walked, took second on a single by Jacoby Ellsbury and scored on a single by Pedroia. Ellsbury’s single extended his hitting streak against Baltimore to 36 games, dating to April 2009. J.J. Hardy hit a two-run homer in the bottom half, only minutes after the scoreboard showed the Yankees increasing their lead over Tampa Bay to 5-0. Hardy’s 30th homer followed a leadoff walk to Davis. NOTES: Boston activated RHP Clay Buchholz (back strain) from the 60-day DL and placed 3B Kevin Youkilis (back strain) on the 60-day DL. … Hardy’s homer gave Baltimore two players with 30 (Mark Reynolds 37) for the first time since 1996, when Brady Anderson had 50 and Rafael Palmeiro hit 39. … Lester’s performance lowered the ERA of Boston’s starters this month to 7.08. … Baltimore RF Nick Markakis left after eight innings with a bruised pelvis.